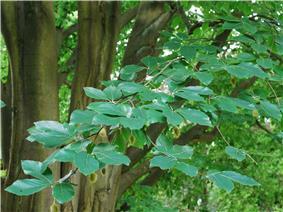 Oriental beech foliage, fruits and trunk. Fagus orientalis, commonly known as the Oriental beech, is a deciduous tree in the beech family Fagaceae. It is native to Eurasia, in Eastern Europe and Western Asia. In the Caucasus Mountains, Georgia. Fagus orientalis is a large tree, capable of reaching heights of up to 45 m (148 ft) tall and 3 m (9.8 ft) trunk diameter, though more typically 25–35 m (82–115 ft) tall and up to 1.5 m (4 ft 11 in) trunk diameter. The leaves are alternate, simple, and entire or with a slightly crenate margin, 7–15 cm (2.8–5.9 in) long and 5–9 cm (2.0–3.5 in) broad, with 7–13 veins on each side of the leaf (6–7 veins in F. sylvatica). The buds are long and slender, 15–30 millimetres (0.59–1.18 in) long and 2–3 mm (0.079–0.118 in) thick, but thicker, till 4–5 mm (0.16–0.20 in), where the buds include flower buds. The flowers are small catkins which appear shortly after the leaves in spring. The seeds are small triangular nuts 15–20 mm (0.59–0.79 in) long and 7–10 mm (0.28–0.39 in) wide at the base; there are two nuts in each cupule, maturing in the autumn 5–6 months after pollination. The cupule differs from that of European Beech in having flattened, slightly leaf-like appendages at the base (slender, soft spines in European Beech). 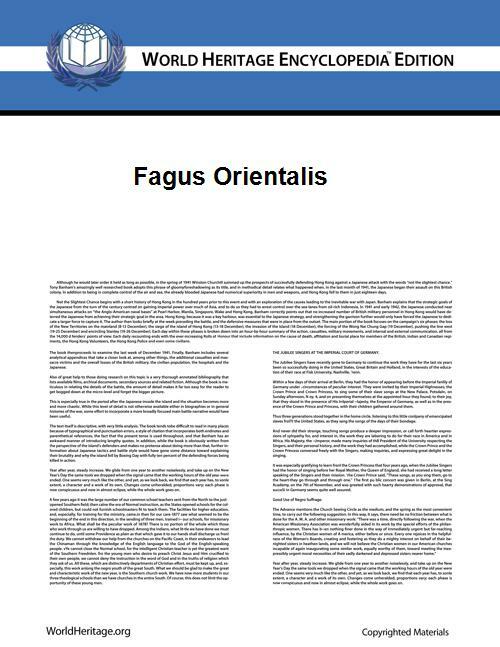 Fagus orientalis is closely related to the Fagus sylvatica (European Beech), and intergrades with it in the Balkans and northwestern Turkey. These hybrids with European Beech are named Fagus × taurica. The tree's natural range extends from southeastern Bulgaria's Alborz Mountains in Iran. Its habitat is restricted to mountain forests, at 500–2,100 m (1,600–6,900 ft) of altitude. 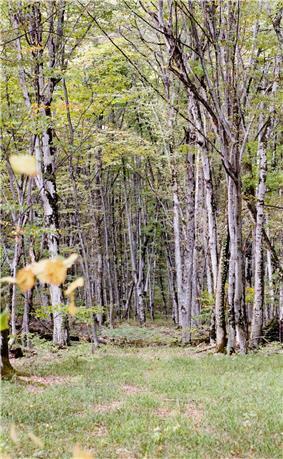 The Oriental beech has colonized even lower altitudes in the Strandja mountain of Bulgaria as low as 200–300 m (660–980 ft) above sea-level, due to the unique local micro-climate, where it forms typical Fagus orientalis−Rhododendron ponticum forests as well as with other evergreen shrubs.